Saffron is the stigma part of the crocus flower (Crocus sativus). The plant is indigenous to Western Asia and has been cultivated for thousands of years. With the opening of East and West trading saffron was introduced to Europe. The French, Spanish and Italians were the first to use it extensively in their cooking. The worlds largest producer of saffron is Iran followed by Greece, Spain and India. Saffron is one of the worlds most expensive spices since it is hand picked and handled very delicately. 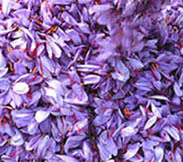 It requires over 80,000 individual flowers to produce a full pound of saffron! Chefs from around the world use saffron in some of their signature dishes. Every Chef knows buying high quality saffron is not easy. A good source of high quality saffron must first be established. There are many lower grades on the market that combine the stamen part of the flower for added weight. Pure saffron is the stigma of the crocus flower (red only) and that is exactly what we offer. Let's face it, you want both quality and value in saffron. As a saffron lover you appreciate the totally unique and seductive flavor, aroma and color saffron lends to a wide range of dishes. You don't want to pay an arm and a leg for good saffron. But saffron is sold in the U.S. is sold in many different grades from several different countries at many different prices. We sell only the saffron stigma. First, everything we sell is 100% pure red saffron and comes directly from the source. There are no other yellow or white plant parts mixed in with the red threads of the saffron crocus plant. This is the only part of the saffron crocus, which produces the saffron flavor and color. The way saffron-grading works is that the lower grades have more yellow left attached to the red stigma. Once you try high quality, long thread, pure red saffron, you will be sold. It is not as expensive as it sounds. An experienced Chef knows that an ounce of saffron goes a long way. You only need a pinch (1/2 teaspoon) to cook a saffron entree for six people. If you calculate saffron's per recipe cost you will see how affordable it is. Our saffron is pure, potent and aromatic and flavors a recipe to feed six for about fifty cents. Pure saffron is shelf stable for several years and it will remain potent if stored tightly in the original container. Saffron coloring strength ranges from 110 to 250 degrees of measured color. Our saffron has a range of minimum of 210 to 250 degrees of color. The testing standards for saffron are written by the International Organization for Standardization (ISO). The coloring strength should be clearly posted on the tin can according to ISO. Our saffron does not contain any other part of the saffron plant except the pure red stigmas, which contain most of the flowers aroma, flavor and natural dye. Coloring power is the only measuring tool that assures you of saffron quality. To get this number, saffron's principal chemical compound, crocin, is measured in a laboratory. Saffron contains several chemical compounds. Crocin is the one measured because it is a precursor to the other compounds, which together produce the three things most chefs are looking for: Aroma, Flavor and Color. Pure, red saffron will measure higher on the coloring scale than saffron, which is mixed with other parts of the saffron plant. As any Chef will tell you, saffron is a wonderful ingredient. It imparts a beautiful color, taste and unique aroma to any recipe where it appears. We like it in signature recipes for risotto, paella, sauces, shellfish and seafood soups, ice cream and desserts! Let your mind create a few new ideas for this wonderful gift of nature. Many Chefs feel that the best way to use saffron is to first infuse it with a liquid. We use warm water or white wine and allow it to steep for several minutes. Our saffron is PAREVE ~ Kosher certified! Click here to buy Saffron!